It was a hot and sunny Labor Day along Florida’s Gulf Coast, and my husband Brian and I were heading home from a friends and family weekend on the Suwannee River, stopping at state parks along the road-trip home. My camera bag, stuffed with extra lenses and binoculars, is practically a third appendage at this point, and I was ready to check out avian life at Econfina River State Park. We followed one of the park’s multiple loop trails, near the very active boat ramp on the Econfina River. 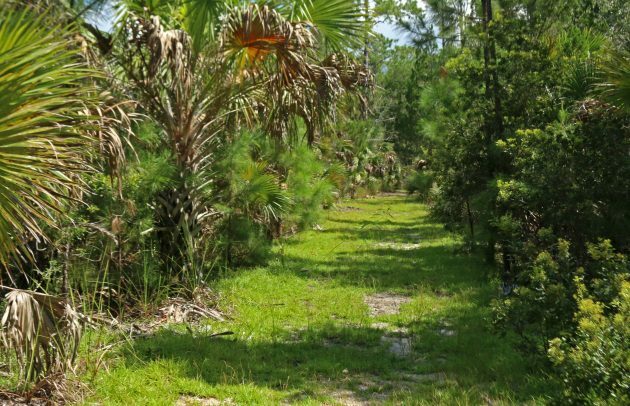 The path was partially shaded by pine trees and the long fronds of the sable palms. In some places bright green grasses grew to our calves, swishing against our legs as we walked. Unfortunately, we hit part of the trail system during high tide, and we would have had to wade across a slow-flowing channel to move past the 1/2 mile mark on the ~2.5-mile route. On a normal day, we probably wouldn’t have minded some short wading, but we were at Stop 1 of what ended up being a four-stop day. Trail at the state park. Luckily, the half mile we had already covered sang with bird calls, and we slowed our pace way down on the way back to the parking area, tracking tiny flicking figures against the leafy and needle-filled canopy. Carolina Chickadees and Common Yellowthroats tittered in the dense canopy at the edge of the trail, while multiple Northern Parulas showed off their colored feathers as they ran along thin branches of deciduous saplings. Even though their plumage was rather worn now in the beginning of September, they still looked stunning. As we continued to walk, we heard a rapid, metallic call echoing from the very tops of nearby trees. Stepping off the trail slightly, we positioned ourselves under the tallest branches as we tried to catch a glimpse of the songbird in the deep shadows. There were two, which you’d think would be helpful, but I found myself swiveling back and forth between the dualing silhouettes, unable to photograph either one. Luckily, the birds stuck around, and eventually I captured a smattering of photos looking straight up. A bunch were just of pale belly, but in a few images the bird had turned just enough for me to catch sight of its eye, the field mark that gave the species away. 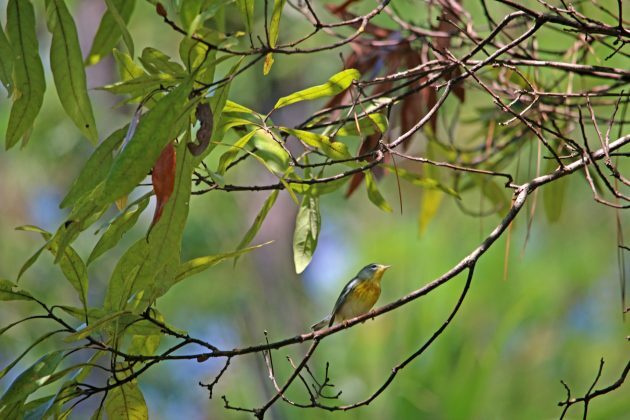 We had found a pair of White-eyed Vireos! According to the Cornell Lab of Ornithology, “A small and secretive bird of shrubby areas of the eastern and southern United States, the White-eyed Vireo is more noticeable for its explosive song than its looks.” I felt a burst of pride when I read the word secretive; that means I am a super birding sleuth, right? 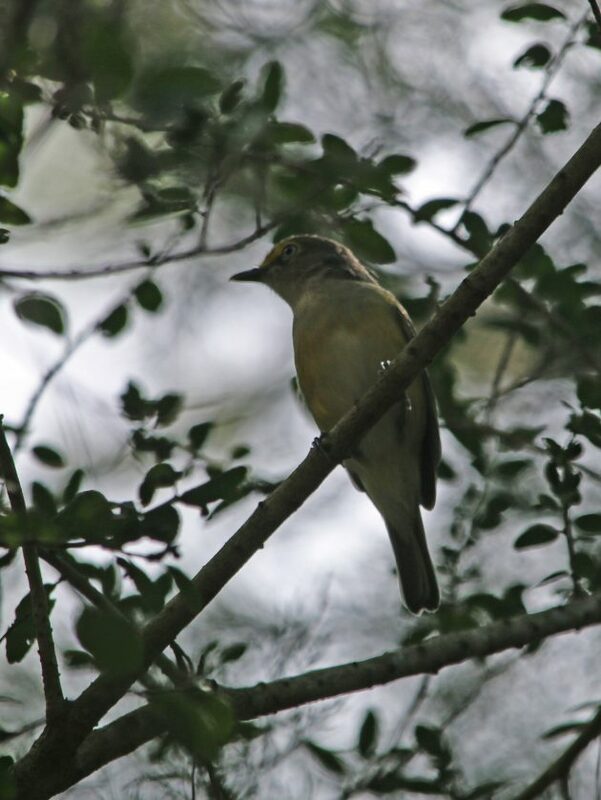 These vireos live in Florida throughout the year, preferring deciduous scrub or fields that have grown over or “streamside thickets.” That description fit the area we stood in Econfina State Park almost perfectly, and I happily recorded the species and location in my Checklist of Florida’s Birds. A great birding end to a great weekend! Where Are You Birding This Third Weekend of October 2011?